These pears not only look amazing but taste delicious and we've flavored ours with Bigelow Earl Grey Tea. Poaching Liquid: In medium saucepan, infuse the Bigelow Earl Grey tea by steeping the tea bag in 4 cups of boiling water for 1 minute. Add sugar, lemon zest and lemon juice, stir until the sugar has dissolved. Place pears in saucepan and simmer, covered for 20-30 minutes or until tender, stirring gently once or twice. When ready, remove and place on a plate. 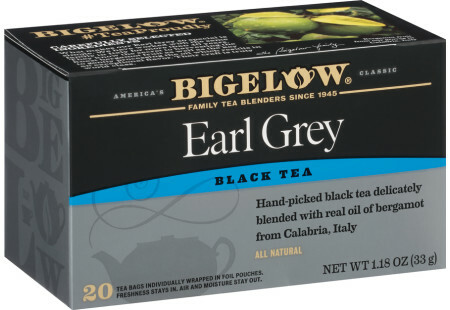 Bigelow Earl Grey Sabayon: In a measuring cup, make the Bigelow Earl Grey tea by steeping 5 Earl Grey tea bags in ¼ cup boiling water for 5 minutes. Strain, set aside. In a large heatproof bowl, combine egg yolks and sugar. With an electric hand mixer, beat on high speed until pale in color, about 3 minutes. Whisk in the Earl Grey tea. Set the bowl over simmering water, beat until the mixture thickens, about 3 minutes. Remove the bowl from the heat, add sifted cornstarch and continue beating until incorporated. To serve, place a pear standing up on attractive plate. Drizzle sabayon down the sides and garnish with mint leaves. If serving cold, keep sabayon refrigerated and beat on high with an electric mixer 1 or 2 minutes to fluff up mixture. Serve as above.